The Toddler Better Health Program is a fun and free 10-week program for families with children aged between 2 and 4 years. This FREE program is held every second Tuesday at BRAMS from 9am to 1pm. 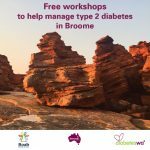 Open to all BRAMS female clients wanting to reduce their risk of chronic disease or manage their diabetes. The Broome Cancer Support Group is a welcoming, informal group that aims to support people in the community whose lives are affected by cancer. We sit down together once a month, have a cuppa, and provide support to each other. If you or someone you know is interested in coming along please contact Cath Kavanagh or Raelene Banks on 9192 7888 for a brief chat before you attend.